McALLEN, Texas — Two days after President Trump ordered an end to the separation of families at the border, federal authorities Friday cast about for jail space to detain them together, leaving hundreds of parents in the dark on when they would be reunited with their children. 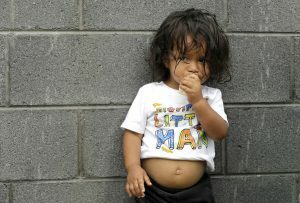 Jesus Funes, a 19-month-old immigrant from Honduras, eats a banana after crossing back into Reynosa, Mexico, with his family Thursday. The family, seeking asylum, said they were told by officials they would be separated, so they voluntarily returned to Mexico. Beyond that, however, there was nothing but frustration and worry for many of the parents separated from their children and placed in detention centers for illegally entering the country over the past several weeks. Some parents struggled to get in touch with youngsters being held in many cases hundreds of miles away, in places like New York and the Chicago area. Some said they didn’t even know where their children were. Trump himself took a hard line on the crisis, accusing Democrats of telling “phony stories of sadness and grief.” He met with parents whose children were killed by immigrants who were in the country illegally, to make the point that they are the real victims of weak borders. “We cannot allow our country to be overrun by illegal immigrants,” the president tweeted. More than 2,300 children were taken from their families at the border in recent weeks. A senior Trump administration official said that about 500 of them have been reunited since May. Trump’s decision to stop separating families, announced Wednesday after a fierce international outcry, has led to confusion and uncertainty along the border. Federal agencies are working to set up a centralized reunification process for all remaining children at a detention center in Texas, said the senior administration official, who spoke on condition of anonymity. An ICE official said it is unclear how families will be reunified. “It’s a big question. There have not been a lot of answers,” Henry Lucero, a director of field operations, confessed at a forum in Weslaco, Texas. In the meantime, federal authorities appear to be easing up on the Trump administration’s “zero tolerance” policy of prosecuting all adults caught illegally entering the U.S. – though the Justice Department flatly denied there has been any change. The federal public defender’s office for the region that covers El Paso to San Antonio said in an email that prosecutors will no longer charge parents with illegally entering the U.S. if they have children with them. Outside the federal courthouse in McAllen, immigration attorney Efren Olivares said 67 people were charged Friday with illegal entry, but none were parents with children. He said it was the first time since May 24 that that happened in McAllen. “It appears that this is a consequence of a change in policy by the government,” he said. In Arizona, the federal public defender’s office in Tucson quickly put together a legal education class for attorneys and advocates on how to handle cases of separated families. Amid the chaos over the zero-tolerance policy, many immigrants continue to seek asylum at the border, and they are typically allowed to stay with their children. ICE has only three facilities nationwide – two in Texas, one in Pennsylvania – that can be used to detain immigrant families, and they have a combined 3,300 beds. The one in Dilley, Texas, opened in 2015 on a remote site that was once an encampment for oil workers. It contains collections of cottages built around playgrounds and common areas, but also has high security. Finding space is not the only hurdle: Under a 1997 court settlement that the Trump administration is trying to overturn, children can be held with their parents in detention centers for no more than 20 days. Zenen Jaimes Perez of the Texas Civil Rights Project said immigrant families are still awaiting details from the administration on how parents and children are to be reunited.